Looking inside the crater and see its sulfur fumaroles while standing on the crater’s rim. Enjoy the panoramic views of the adjacent snow-covered volcanoes. is Ecuador’s second highest peak at (5,897 m/ 19,347ft), located just 55 km (34 miles) south of Quito. It is famous for its perfect cone-shaped peak, and snow-covered crater. It’s geographic positioning results in more clear days on Cotopaxi than on any of the other high altitude mountains in Ecuador. This means that for most climbs, you will be able to enjoy a beautiful view over the wide Andes landscape at most of the snow-capped peaks in Ecuador. At the summit, you will also be able to enjoy a remarkable view into the crater of Cotopaxi. The crater is 800 m (2624 ft) in diameter, with a steady slow emission of gases and steam. Cotopaxi has a history of roughly 100 year eruption intervals. The first record of its eruption was in 1534, during the Spanish conquest. Cotopaxi erupted during a battle between the Spanish and the Incas, causing both parties to run. The Incas viewed Cotopaxi as a spiritual symbol and interpreted the eruption as an ominous sign; while the Spanish soldiers were simply terrified as they had never experienced volcanic activity. The last major eruption was in 1877, and the present activity levels have been reduced to gas and steam emissions. The first to climb to the rim of the crater in 1872 were Wilhelm Reiss, a geologist from Germany, and Angel Escobar, from Colombia. They ascended over a still warm lava flow. Then in 1880, the British mountaineer Edward Whymper climbed Cotopaxi from the north, which is still the most popular route. 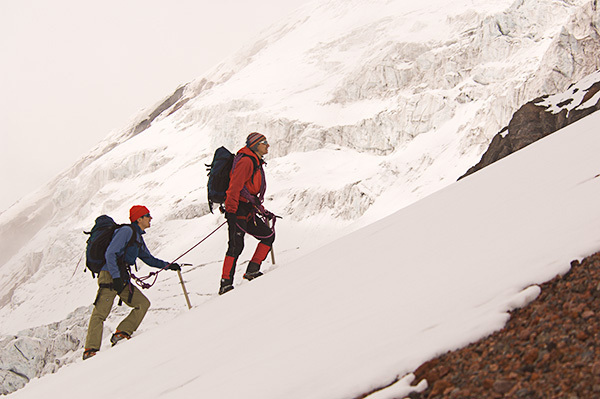 The characteristic relatively stable weather conditions on Cotopaxi enable year round access. It is not a technically difficult ascent, but there is a section just before the final summit slope with complex crevasse patterns and snow bridge crossings. This section requires proper ice climbing gear; while the climb in general necessitates adequate acclimatization to high altitude, and good physical condition. Like all snow-capped peaks in Ecuador, avalanches are common during the day due to the more direct angle of the sunlight characteristic of regions this close to the Equatorial Line. As a safety measure, we will climb at night and reach the summit by 7:00 a.m., this will enable our safe return to base camp before the snow pack becomes too warm and soft. We drive to the base of Cotopaxi at 4,600 m (15,091ft). From here we will hike up to the Jose Rivas Refuge at 4,800 m (15,748 ft). 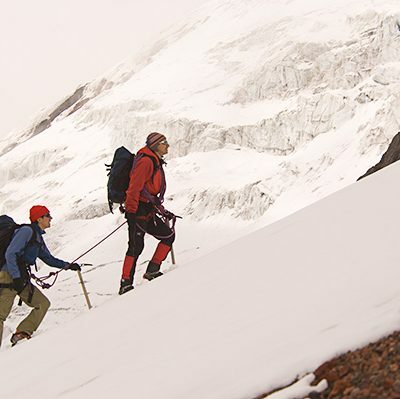 Then we will review our glacier and technical skills to prepare for the ascent of Cotopaxi. Today we climb Cotopaxi. Our day starts early to ensure we have enough time to reach the summit by 7:00 am. After 6 to 7 hours of climbing we will watch the sunrise, and begin our descent. It will take 2 to 3 hours to return to the Jeep and then we will drive to Quito.